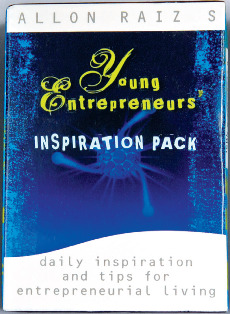 The Young Entrepreneurs Inspiration Pack, tailored to assist young entrepreneurs and aspiring entrepreneurs, consists of four different types of cards: Self Confidence: Assists with building entrepreneurial self-confidence. Research: Assists in ensuring all the basics of starting a business are covered. Pitfalls: Assists in avoiding potentially devastating entrepreneurial pitfalls. Lateral Thinking: Assists with mining lateral ideas around business ideas and also designed to get you out of creative traps!